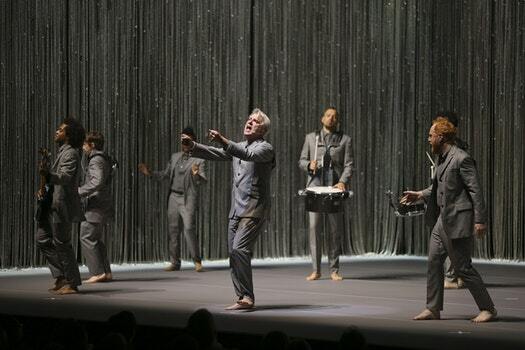 By design, David Byrne doesn’t speak very often during his meticulously designed show. On Thursday, on the first of two nights at the Orpheum Theatre (read my review), the Talking Heads talking head paused to step out of character, so to speak, three times. Lastly, the Rock Hall of Famer introduced his final piece of the night, a cover of Janelle Monae’s 2015 tune “Hell You Talmbout" (see her version below) by saying that she gave him permission to update it. The song is a protest piece about racial violence, with the names of victims repeated over and over. Indeed, Byrne and his band rebooted the song to include Philando Castile, the St. Paulite shot by a police officer during a routine traffic stop in Falcon Heights in 2016. Byrne performs again on Friday at the Orpheum.